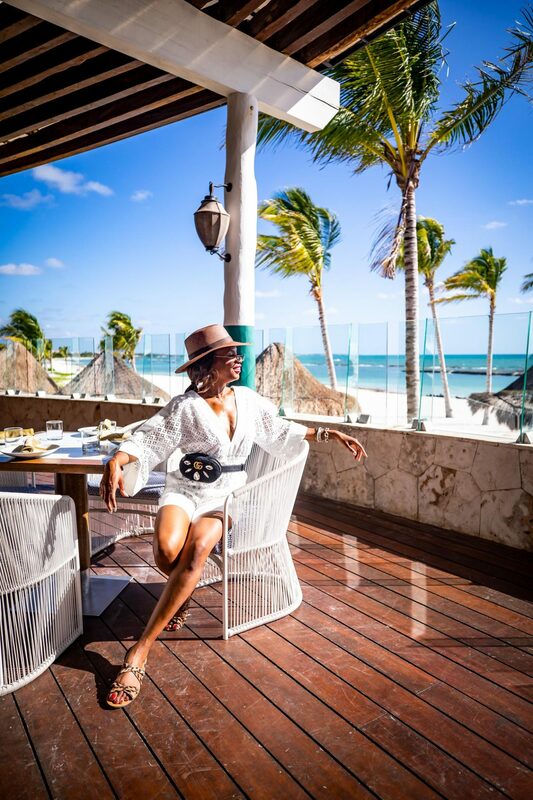 My family and I recently enjoyed a full week unwinding at the Fairmont Mayakoba in Playa del Carmen. We’ve had a very busy year, so it felt amazing just being able to relax and enjoy quality family time together. We vacation often, but I knew I wanted a resort experience this time so I was excited to see what the Fairmont had to offer. It was truly a little paradise on earth. Everything about this resort was spectacular. The rooms were amazing, the beaches were breathtaking, and the service was exceptional. There was so much to do at the resort. It was great for my husband and I as well as our children. We had a full week of activities lined up, but my favorite was enjoying the couples day spa, boat ride, and Halloween and movie night with the kids. The couples spa experience was just what we needed. We enjoyed relaxing, side-by-side massages and treatments designed for us to experience as a couple. Our boat ride was something we enjoyed as a family. 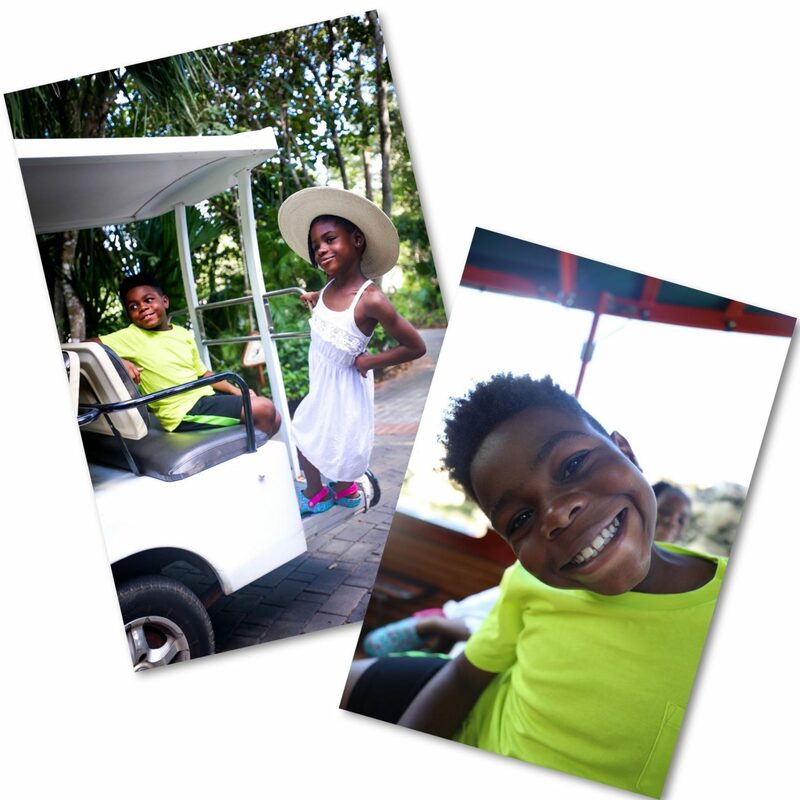 We were able to see more of the island, soak up the sun, and cruise on a relaxing ride through the beautiful jungle. We chose this particular resort because of the Discovery Club & Adventure Camp. 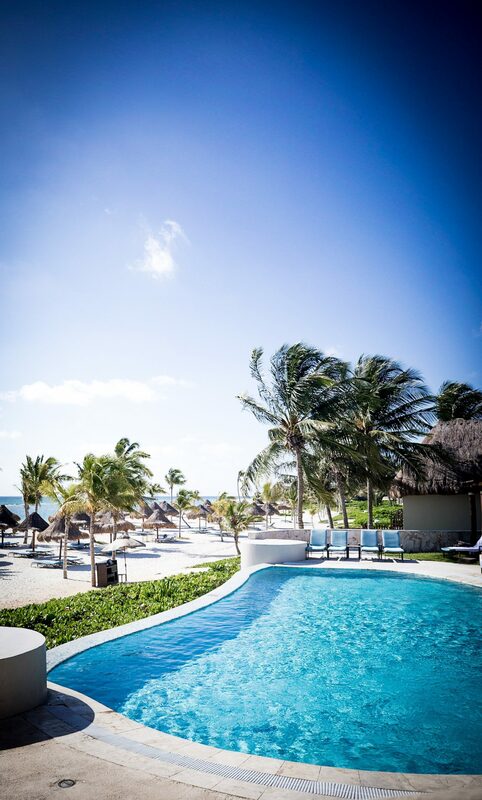 The Fairmont Mayakoba, Riviera Maya is a kid’s paradise. It was important to us that the kids have an amazing experience as well. Halloween and movie night were 2 of their favorite moments. They were also happy just hanging out at the pool. Packing style options for this trip was a breeze. I knew I wanted to keep it light and colorful. And I wanted pieces that were fun and functional. 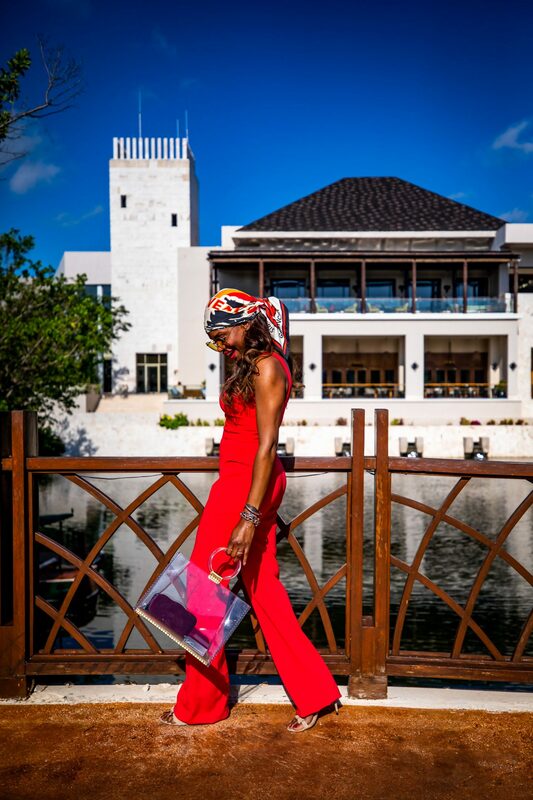 I packed my favorite one-piece swimsuits, a couple dresses to wear for dinner and sitting pool-side, and a few cool options for touring the resort and just hanging out as a family. 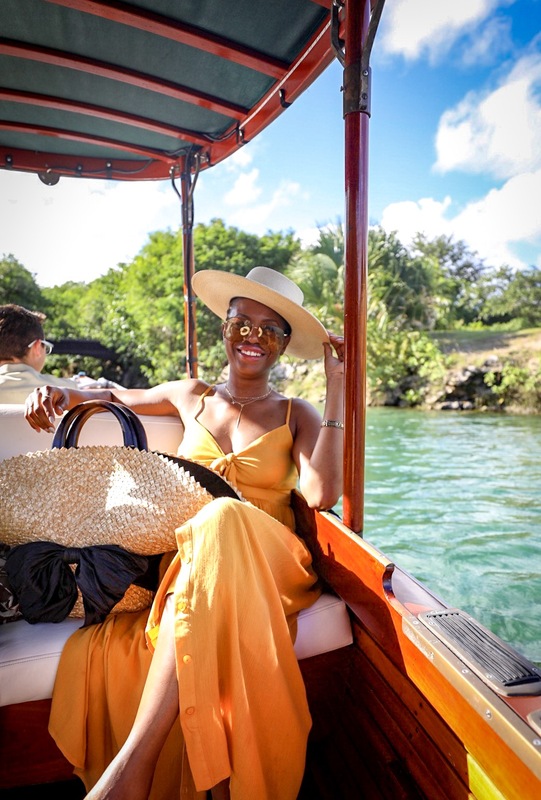 My cool yellow maxi dress was perfect for our boat ride. And, the straw hat and purse I used to accessorize my look worked so well. 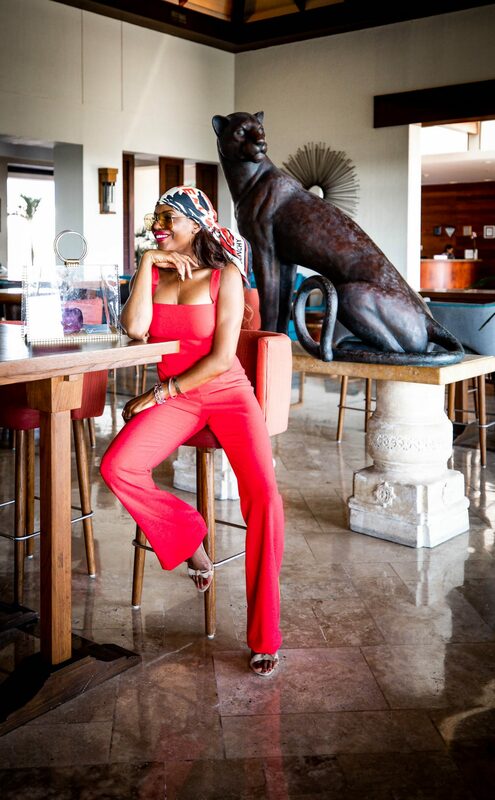 I couldn’t wait to pullout my red jumpsuit. It had a modern resort feel that wore to dinner and grabbing a drink at the bar. I finished the look by tying a printed scarf around the crown of my head for that chic, carefree vibe. red swimsuit on sale for $58.99 . beach bum swimsuit on sale for $15.99! No vacation is complete without being able to enjoy amazing food. We ate at 3 restaurants, and each of them was delicious. The food was fresh, the service was stellar, and the atmosphere was lovely. 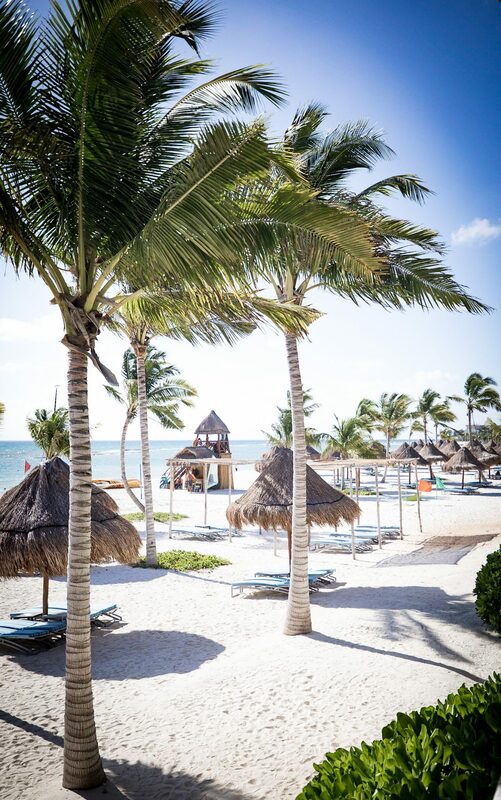 If you’re looking for a family-friendly vacation destination, I highly recommend the Fairmont Mayakoba in Playa del Carmen. Everything you need to have an amazing experience is all in one place. It truly something the whole family will enjoy.